My trusty Let’s Go Central America guide had warned me about Belize City. Well, maybe warn is a strong way of putting it. 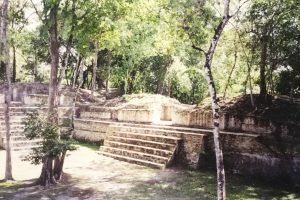 It advised me that if I was in Belize there were better ways to spend my time then spending it in Belize City, the former capital of the youngest Central American nation. 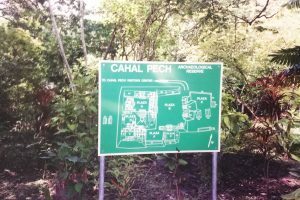 I decided to follow the advice and planned to spend as little time in the city as needed, getting on the first boat to Caye Caulker, which I was told was one of the nicer islands off the coast of Belize. 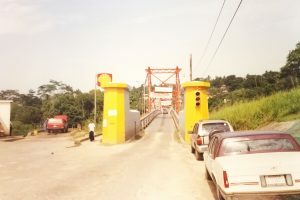 Nonetheless I was intrigued about seeing the Swing Bridge in Belize City. 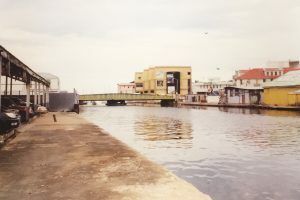 It was one of the tourist destinations listed in my guidebook and I was curious to see one of the last manually operated swing bridges in the world (as well as the oldest one in Central America). This despite the fact that, up until then, I really didn’t know what a swing bridge was. Keep in mind, Wikipedia really wasn’t a thing back in 2003. Fortunately the dock where I got on my boat to Caye Caulker was near the Swing Bridge and I got a chance to see it, although I never actually got the chance to see it swing. 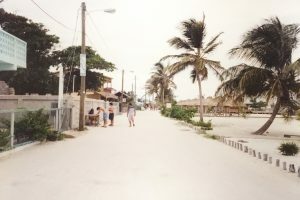 Arriving in Caye Caulker I was immediately glad that I chose this as my major destination in Belize. Unlike Belize City, which I could tell was hectic and crowded, Caye Caulker was quiet, tranquil, and very Caribbean in it’s feel. Ispent the first day walking the streets of the small town before stopping at the L&I Café and Bar for a quick midnight snack. 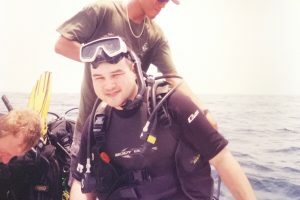 The following day I decided to get in a dive. It had been close to fifteen years since my last dive so I didn’t think the Blue Hole would be wise, that was not the sort of dive you jump into (no pun intended). 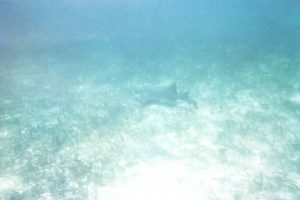 Instead I signed up for a shallower dive with Frenchie’s Diving, and did get a chance to see a what appeared to be a Sandbar Shark, which made my dive a rousing success in my book. When it comes to scuba diving I’m easy to please. If I see a shark I’m usually happy. The following day I made my way back to Belize City en route to San Ignacio near the border with Guatemala. My main goal was to get to El Salvador for a chance to go surfing in La Libertad and I had a lot of stops I wanted to make on the way. But I also was excited about the opportunity to see one of the world’s smallest capitals: Belmopan. I’m glad I had the chance to stop there because the Belmopan I spend an hour in is long gone. Back in 2003 it was a small village of 5,088 (according to the 2000 census). 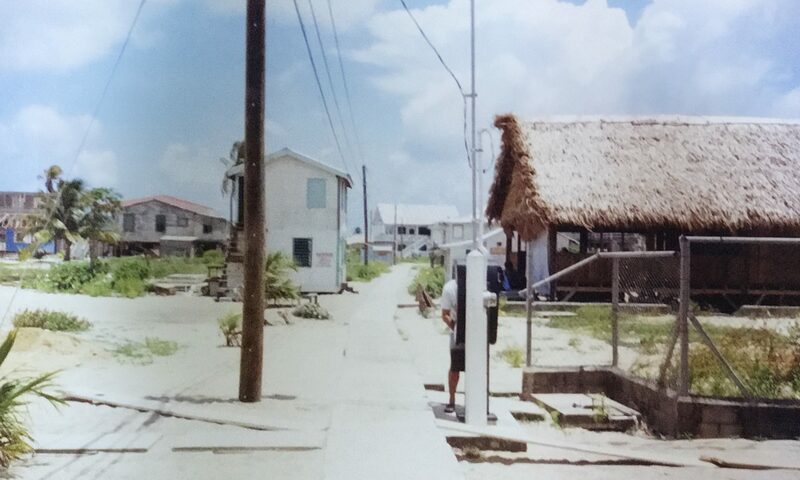 It seemed like people just weren’t interested in moving to the new capital, which was founded in 1970 as a planned community after Hurricane Hattie all but destroyed Belize City in 1961. In 1980 the population was a mere 2,935 and eleven year later the population had only inched up to 3,558. But after the US embassy relocate to Belmopan in 2006 there seems to be rapid growth in the city and the current estimate is that the population is now somewhere around 21,814. Maybe Belmopan now resembles the hectic and chaotic Belize City that I spent just a few hours in before making my way to Caye Caulker and then onto a bus to San Ignacio. 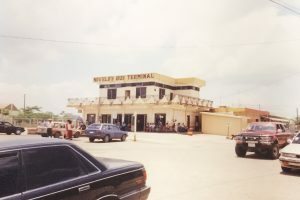 But in 2003 it was a quiet and peaceful stop…at least around the Novelo’s Bus Terminal. 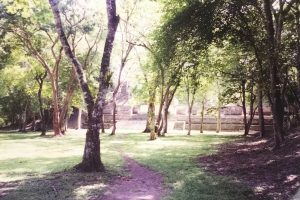 Arriving in San Ignacio I wasn’t sure how I would spend my final days in Belize before making my way to Guatemala. I enjoyed seeing one of only three traffic lights (at least it was one of three in 2003) when I crossed over the Hankesworth Bridge in San Ignacio. The Hankesworth Bridge was a one lane suspension bridge built in 1949 and it was interesting…but let’s be honest, if all I could say about Belize was I saw a couple of cool bridges it wouldn’t be much of a post here. After spending a night in San Ignacio I decided to sign up for the Barton Creek Canoe tour on August 2nd. 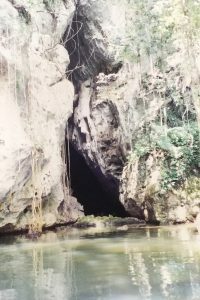 Our colorful guide, Clifford, took us inside the Barton Creek Cave by way of canoe and although my photos weren’t the best, it was definitely a great way to spend the day in San Ignacio. 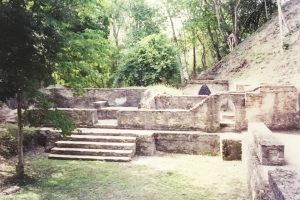 My next stop would be my first Mayan Ruin, Cahal Pech, before I closed the night off by going to the Miss Estereo Amor Pageant 2003. I was told that this was the biggest event in town and many of the locals were positively excited about the local beauty pageant…which was almost entirely in Spanish. The following morning I closed out my day in Belize by having mangos on the side of the Macal River. But there was one thing I hadn’t tried in Belize, and I was determined not to leave before I had the chance to try fried breadfruit. My flight back to Denver was out of Belize City so I planned one day in Placencia, Belize after returning by bus from El Salvador. I was young enough that another bus ride from Belize City to Placencia didn’t seem so bad. And it gave me one more day on the beach before I was to start my law school career. I enjoyed my downtime and soon found a small, out of the way restaurant that could prepare a plate of fried breadfruit. 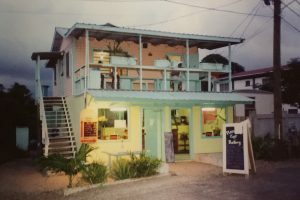 It wasn’t on the menu but the cook seemed genuinely impressed that I was ordering it and I quickly found out why it was so popular in Caribbean countries: it was amazing. 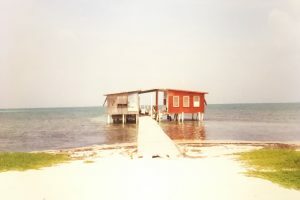 Sometimes I wonder how much Belize has changed since 2003. 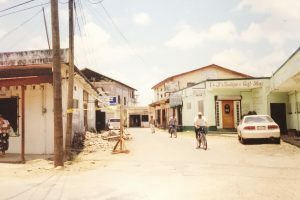 Undoubtedly Belmopan won’t look like the dusty town I passed through and who knows, maybe Belize City is a little more tourist friendly than it was back in 2003. But something tells me even if the country doesn’t quite look like the same place I saw in 2003 that it still has a certain charm to it that would ensure I fall in love with the place all over again. The perfect balance of Latin and Caribbean cultures topped off with a Belikin Beer and some fried breadfruit. 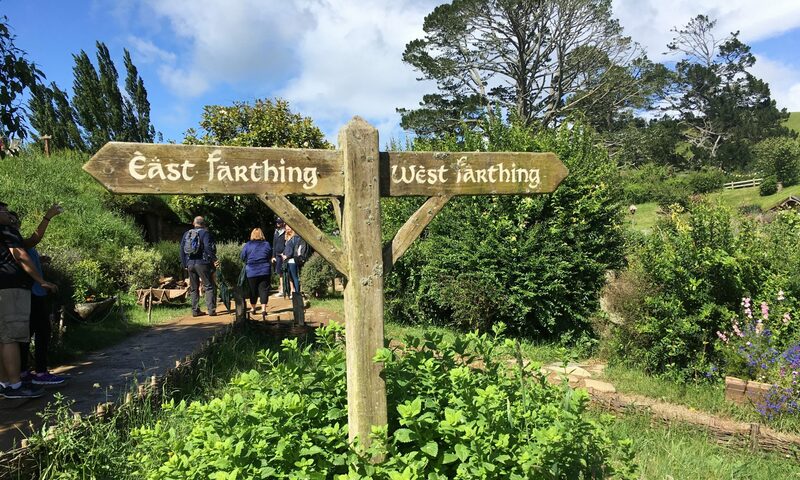 Read more Finger Post Travel stores here!